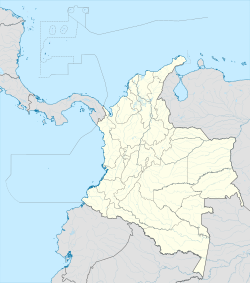 Suesca is a town and municipality in the Almeidas Province, part of the department of Cundinamarca, Colombia. It is located on the Altiplano Cundiboyacense at 59 kilometres (37 mi) north from the capital Bogotá. Suesca forms the northern edge of the Bogotá savanna and is a scenic countryside town which is well known because its landscape attracts devotees of rock climbing, trekking, and rafting. It is surrounded by dairy farms and flower plantations. The municipality borders Cucunubá and Lenguazaque in the north, Sesquilé in the south, Chocontá in the east and Nemocón and Gachancipá in the west. The name Suesca is derived from the Chibcha word Suejica, Sueica or Suesuca, which means "Rock of the birds" or "Tail of the macaw". Suesca was inhabited early in the history of inhabitation of the Altiplano and the rock shelters formed the site for semi-nomadic hunter-gatherers of the Herrera and preceramic periods. Before the Spanish conquest, Suesca was part of the Muisca Confederation. The cacique of Guatavita ruled over Suesca, the village close to the sacred Lake Guatavita and containing Lake Suesca where rituals were held. Suesca formed an important centre on the trade road to Boyacá, ruled by the zaque of Hunza. The merchants took carbon and salt on their way to the north. Every four days a market was held in Suesca. Suesca was also an important settlement for the pottery made by the Muisca. When conquistador Gonzalo Jiménez de Quesada arrived in Suesca in March 1537 he founded the modern town. In Suesca he sentenced a soldier of his army to death, for stealing mantles from the Muisca. After submitting the zaque of Hunza, Quemuenchatocha, the Muisca ruler was taken prisoner to Suesca in an attempt to let him reveal the location of his treasures. When the zipa of Bacatá, Tisquesusa, heard about the Spanish presence in Suesca, he sent a spy to the town to gain information about their strength. The Muisca, unfamiliar with horses and horseback riders, thought that the horse and the rider were one. When a horse died in Suesca, they found out this was not the case. Suesca is also the place where De Quesada died in 1579, after writing the now lost work Ratos de Suesca. In 1602 in a cave in Suesca 150 Muisca mummies were discovered. The mummies were organised in a circle around the mummie of the cacique of the town. Also rock art has been found in Suesca. The pictographs of Suesca are among the most extensive of Cundinamarca, but at the same time the most vandalised. Lake Suesca - a natural lake that is located at 3,000 metres (9,800 ft) above sea level. It is found 10 kilometres (6.2 mi) from Suesca town. Rocas de Suesca - natural cliffs approximately 4 kilometres (2.5 mi) long that are located 1 kilometre (0.62 mi) before arriving to Suesca town. A beautiful landscape, the rocks are ideal for people who love trekking and climbing. The rocks of Suesca are considered the birthplace of Colombian rock climbing, and feature over 400 routes on excellent quality sandstone up to several pitches in length, with a majority of routes being one pitch. The area is best known for traditional climbing, but there are many sport (bolted) routes as well. The Bogotá River flows along the Rocas de Suesca. To arrive at the cliffs, one walks from the town along the train tracks for about 10 minutes. The train only runs very early in the morning, so there is little danger. Camping is available very close to cliffs or there is reasonably priced lodging close to Rocas de Suesca. By car from Bogotá, one should take Autopista Norte that goes to Tunja, passing a toll bridge in Autopista Norte then one will pass Briceño, the town of Tocancipá and a second toll bridge then you will find on the main road to Tunja a crossroads; right leads to Sesquilé and left to Suesca, Suesca is approximately 15 kilometres (9.3 mi) from the main road. It is about 59 kilometres (37 mi) from Bogotá to Suesca, around an hour and a half travel time. By bus from Bogotá, one can take city buses to the large public transportation terminal called Portal Norte de Transmilenio, and from there the Flota Alianza bus to Suesca. These buses are quite frequent. From downtown Bogotá by public transportation one should budget about 2 hours to get to Suesca, or one hour from the Portal del Norte terminal. Bohórquez Caldera, Luis Alfredo. 2008. Concepción sagrada de la naturaleza en la mítica muisca - Sacred definition of nature in the Muisca mythology. Franciscanum L. 151-176. Casilimas Rojas, Clara Inés, and María Imelda López Ávila. 1987. El templo muisca - The Muisca temple. Maguaré 5. 127-150. Accessed 2016-07-08. Espejo Olaya, Maria Bernarda. 1999. Notas sobre toponimia en algunas coplas colombianas - Notes about toponomy of some Colombian ballads - Thesaurus, 1102-1157. Tomo LIV, Núm. 3.; Accessed 2016-07-08. Francis, John Michael. 1993. "Muchas hipas, no minas" The Muiscas, a merchant society: Spanish misconceptions and demographic change (M.A. ), 1-118. University of Alberta. Gamboa Mendoza, Jorge. 2008. Los Muiscas en los siglos XVI y XVII: miradas desde la arqueología, la antropología y la historia - The Muisca in the 16th and 17th centuries: views from the archaeology, the anthropology and the history, 1-318. Universidad de Los Andes. Martínez Celis, Diego, and Álvaro Botiva Contreras. 2004. Manual de arte rupestre de Cundinamarca - Manual of rock art of Cundinamarca, 1-60. ICANH. Martínez Martín, Abel Fernando, and Luz Martínez Santamaría. 2012. Sobre la momificación y los cuerpos momificados de los muiscas - On mummification and the mummified bodies of the Muisca. Revista Salud Historia Sanidad 1. 61-80. Muñoz, Guillermo. 2006. Pinturas rupestres en el Altiplano Cundiboyacense, Colombia - Rock paintings on the Altiplano Cundiboyacense, Colombia, 1-21. Rey Pereira, Carlos. 2000. Discurso histórico y discurso literario. El caso de El Carnero - Historical and literary discourse. The case of El Carnero (PhD). Universidad Autónoma de Madrid. Wills, et al., Fernando. 2001. Nuestro patrimonio - 100 tesoros de Colombia - Our heritage - 100 treasures of Colombia, 1-311. El Tiempo. Wikimedia Commons has media related to Suesca. This page was last edited on 5 February 2019, at 13:10 (UTC).